What Are Quantitative Comparison Questions? First things first: what are Quantitative Comparison questions and how critical of a role do they play on the GRE? There are two Quantitative Reasoning sections on the GRE. Each section contains 20 questions, of which seven to eight are Quantitative Comparisons. 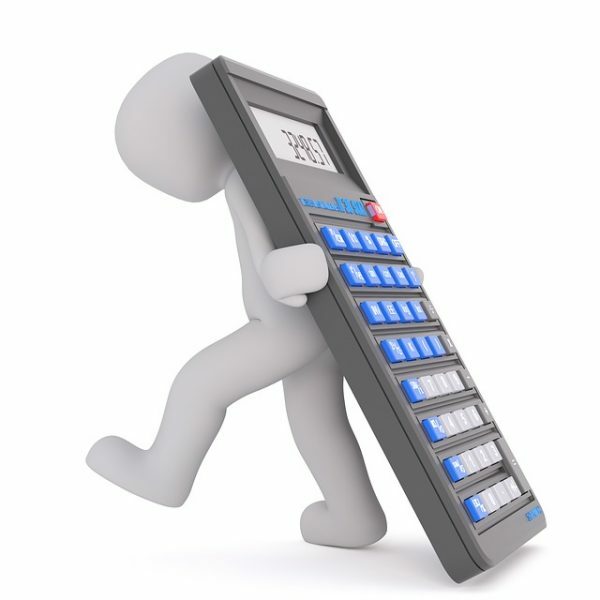 (In addition to Quantitative Comparisons, Quant consists of multiple choice and Numeric Entry questions.) Every test taker will have a grand total of about 15 Quantitative Comparisons while taking the GRE. Clearly, Quantitative Comparisons make up a significant portion of the exam (not to mention your Quant score)! Quantitative Comparisons cover a wide array of topics, including arithmetic, algebra, geometry, and data analysis. But the answer choices above are the same answer choices for all Quantitative Comparison questions, regardless of the type of math they’re testing. So there’s no need to worry about any sudden changes or curve balls. This is actually one of the few times the GRE isn’t actively trying to trick you (yippee!). These are the basics of Quantitative Comparisons. But what are some specific strategies you can use when facing these questions on test day? Quantitative Comparisons can be tricky for first-time GRE takers, but they’re certainly not unbeatable. 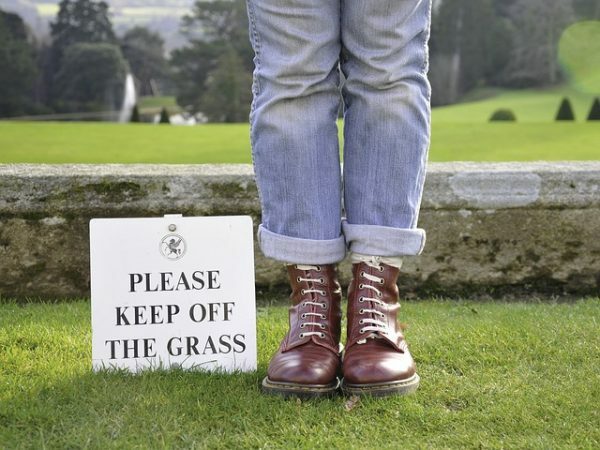 Here are our top five tips for approaching (and solving!) GRE Quantitative Comparison questions. As soon as you encounter a Quantitative Comparison question on the GRE, try to pinpoint the exact topic it’s testing you on (e.g., geometry, algebra, etc.). Being aware of the type of math you’re dealing with allows you to anticipate what sorts of rules, formulas, or strategies you might be able to apply to a particular problem. For example, with a Quantitative Comparison question focusing on data analysis, you’ll likely have to solve for means, medians, modes, and other statistical concepts. Likewise, if you encounter a pair of shapes, you can expect to have to calculate areas, perimeters, circumferences, etc. In order to identify the type of math being tested, you’ll have to have a rough idea of how different types of math are normally presented in Quantitative Comparison questions on the GRE. Typically, geometry questions contain diagrams of shapes; algebra questions contain equations and inequalities; and data analysis questions contain tables and graphs. 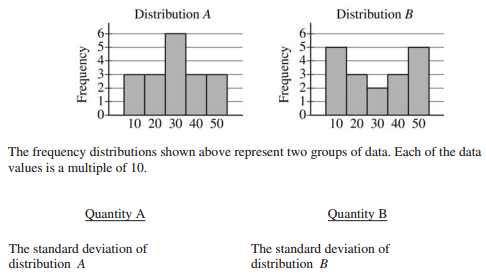 Because of the presence of a histogram, we can immediately recognize this problem as a data analysis question — specifically, one testing us on our knowledge of standard deviations and distribution. Unlike our previous example, this Quantitative Comparison contains neither a graph nor a description; all it offers are quantities. But don’t make the mistake of assuming all questions centering on a certain math concept will appear the same on the GRE. Why? Because this question is a data analysis question, too! Confused? Take a closer look at the quantities in our examples above. Both questions are asking you to compare standard deviations — a telltale indicator that each of the problems is focusing on data. 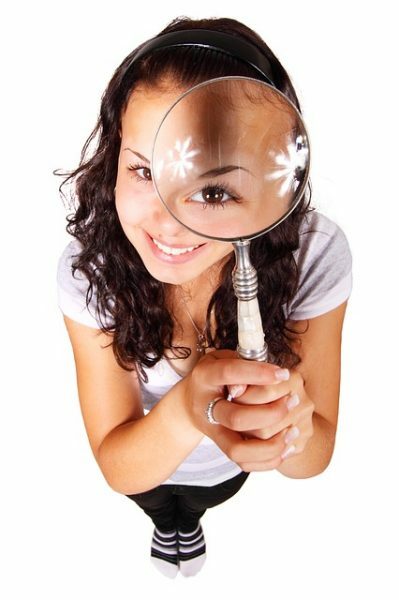 If you’re ever stuck on a Quantitative Comparison question, look for keywords in the description (if present) and quantities to help you determine the topic being tested. Keywords are any major terms commonly associated with certain fields of math, such as the names of shapes (for geometry) or the words “slope” and “variable” (for algebra). Another step to take before attempting to solve a Quantitative Comparison is to determine whether there are any rules or formulas you’ll need in order to solve the problem. 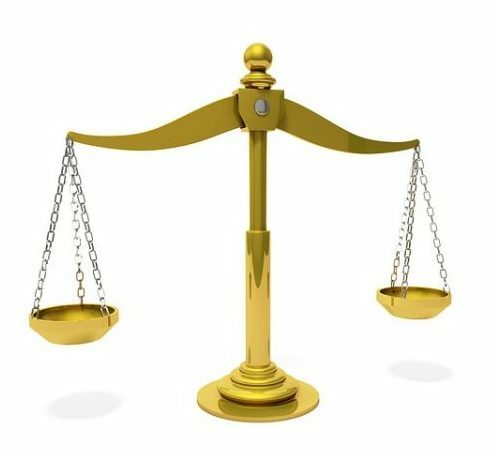 In reality, many Quantitative Comparison questions can only be solved through the application of a law or formula. For example, if you can’t recall the circumference formula, you’ll be unable to solve a Quantitative Comparison asking you to compare the circumferences of two separate circles. Just by glancing at the diagram, you should be able to identify the problem as a geometry question involving angles. Now, look at the quantities. We’re being asked to compare the sums of two sets of angles, but we’re given no specific values for any of the angles. Thus, we’ll have to rely on our knowledge of the rules of angles — specifically, the rules of angles created by a line intersecting two parallel lines. Allow me to explain what I mean by this. 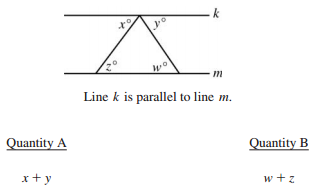 The problem above states that lines k and m are parallel to each other. (Never assume two lines are parallel unless clearly indicated.) Two lines are intersecting k and m in a triangular shape to create a total of seven angles. 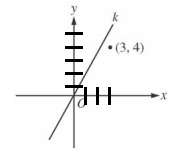 Four of these angles are given degree measurements of x, y, z, and w. As geometry problems are not drawn to scale on the GRE, we cannot make any assumptions about the measurements of these angles. So how are we supposed to compare the sums of the angles? By applying the rule of alternate interior angles. Look at the first intersecting line (the one making angles measuring x and z degrees). Because lines k and m are parallel to each other, the angles for x and z are therefore alternate interior angles. According to the rules of geometry, alternate interior angles are always equal in measure, so $x=z$. Now, look at the other intersecting line (the one making angles measuring y and w degrees). The angles for y and w are in similar positions as x and z and are therefore also alternate interior angles, so $y=w$. Because $x=z$ and $y=w$, Quantities A and B are essentially combining the same values and will therefore produce equivalent sums. The correct answer is C: The two quantities are equal. 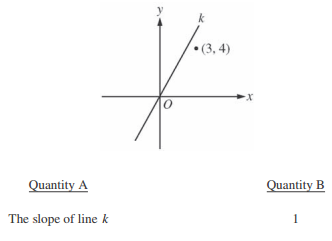 In this question, we’re being asked to compare the slope of line k to Quantity B (1). Thus, in order to compare the two quantities, we must know how to find a slope using the slope formula. To use this formula, we must first identify two sets of coordinates on our line. Start by looking at the coordinate system above. 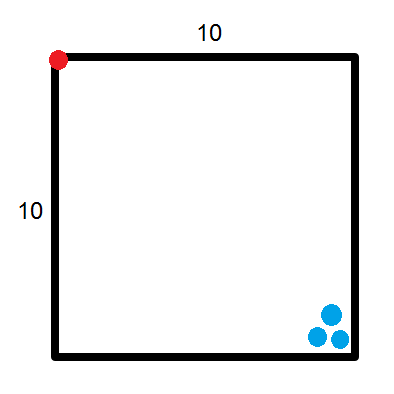 Because the line passes straight through the center point of the plane, one of our points is, for certain, (0, 0). 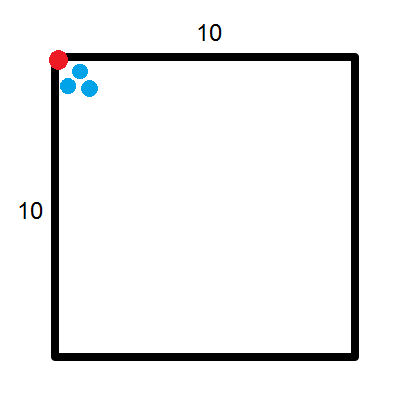 According to our calculations, the slope of line k is somewhere around 1.67 or 2. Both of these numbers are larger than 1, so the correct choice is A: Quantity A is greater. Generally, it’s best to choose a pair of numbers that differ greatly from each other, such as a positive number and a negative number, a small number and a large number (i.e., two extremes), 0 and a non-zero number, etc. Often, expressions work consistently for closely connected values but won’t work at all for rare or special values, such as 0, negative numbers, and fractions. As a result, these are good numbers to choose when testing an expression or equation. According to this Quantitative Comparison, x cannot equal 0 (but can equal a negative or positive number). Because we aren’t given an exact value for x, let’s try plugging in a combination of positive and negative numbers to see how they affect the quantities. But before we start choosing values, look at Quantity A. The absolute value of -2 is always 2, so let’s rewrite this expression more simply as $|x|+2$. 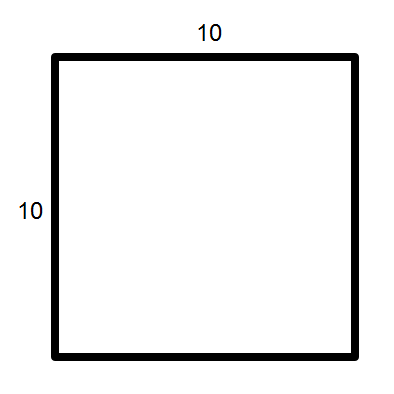 In this scenario, the two quantities both come out to 3 and are therefore equal. But this isn’t the same result we initially got. When $x=1$ Quantity A is greater than Quantity B, but when $x=-1$ the two quantities are equal. Therefore, the correct answer is D: The relationship cannot be determined from the information given. Although a convenient strategy, plugging in numbers isn’t always necessary if you can simplify the algebraic expressions and compare the two quantities as is. This can only be done if both quantities contain the same variables. This Quantitative Comparison is clearly an algebraic one revolving around the variable x. We know $x>1$ but have no idea what the value of x actually is, so let’s look at the two quantities for a moment. Because both contain the same variable and are written using exponents, we should be able to compare them using the laws of exponents. As you can see, $x^8$ is just eight x’s multiplied together. If we were to multiply this expression by another x, we’d have nine x’s, or $x^9$. In the end, Quantity A simplifies to $x^9$ and Quantity B also simplifies to $x^9$. 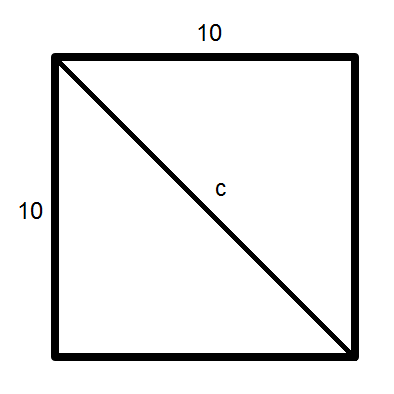 The answer is C: The two quantities are equal. Drawing a diagram is an especially helpful method when faced with a Quantitative Comparison centering on geometry. By drawing the shapes described in a problem, you’ll be better able to understand the relationships among values and won’t lose track of what formula or rule you need to focus on. What we know for sure is this: the power station is located somewhere along the perimeter of the square, and the three substations are located somewhere inside the square. In this example, all three substations are around 14 miles away from the power station (their distances are slightly less than 14 as they cannot be placed directly on the corner). Let’s say their distances from the power station are 14, 13, and 12.5 miles, respectively. By adding these numbers together, we get a total of 39.5 miles, which is more than 30 miles. So, in this scenario, Quantity A is greater than Quantity B.
Let’s say their distances from the power station are 1, 2, and 2.5 miles, respectively. Altogether, this distance equals only 5.5 miles — significantly less than the 30 miles listed for Quantity B. In other words, in one scenario Quantity A is greater than Quantity B, and in another scenario the opposite is true. The correct answer, therefore, is D: The relationship cannot be determined from the information given. Because Quantitative Comparison questions are such a large part of Quant, it’s important you give ample attention to these types of questions in your study sessions. Below are some of our top tips for effectively studying Quantitative Comparisons. Remember, these answer choices are the same for all Quantitative Comparison questions, no matter what type of math is being tested. You’ll always be directly given the answer choices for Quantitative Comparisons, but not having to pore over each answer choice individually should save you at least a couple of seconds for each question. This isn’t to say you should simply forgo studying geometry, arithmetic, and data analysis; these topics are commonly tested, too. Just know, however, that Quantitative Comparisons expect you to be most familiar with algebra. The best way to study for the GRE in general is to use reliable prep materials, or those that test you on concepts and question types similar to what’s on the actual test. More specifically, use your study materials to practice Quantitative Comparisons and to gauge what topics are easy or challenging for you. For example, if you’re struggling to understand algebraic Quantitative Comparisons, use your prep books to review basic algebra concepts and drill GRE-like questions. Always opt for official materials, as they offer Quantitative Comparison practice most similar to those you’ll encounter on test day. 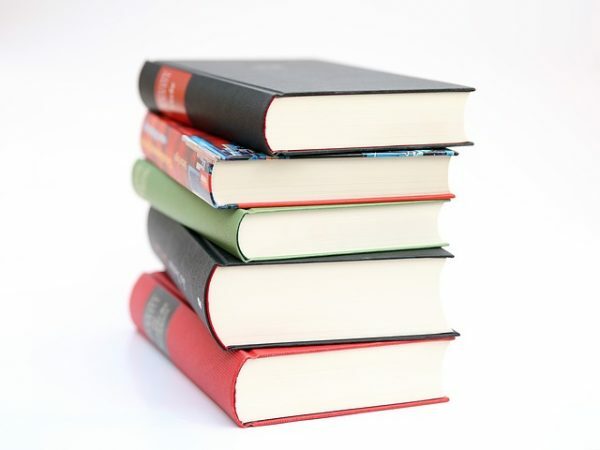 Check out our articles for more info on the top GRE prep books you can use and the best resources currently available for GRE math practice. You can also test out your Quantitative Comparison skills using official practice tests. At present, ETS offers six official practice tests free of charge. With these tests, be sure to imitate a real GRE setting as closely as possible by giving yourself ample scratch paper ahead of time and finding a quiet area to take the test. Quantitative Comparison questions account for more than a third of GRE Quant. Therefore, it’s important you familiarize yourself with the types of math these questions test in addition to how they’re likely to be tested. Hopefully, you now have a little more confidence when it comes to tackling Quantitative Comparison questions on the GRE! Looking for more Quant resources? 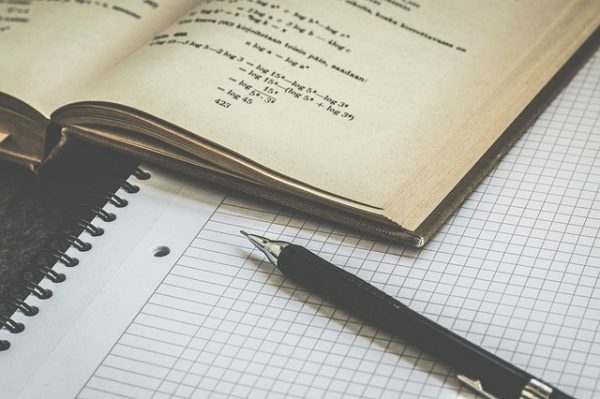 Check out our in-depth guide to the most important GRE math formulas you should know, and explore our expert picks for the best resources for GRE Quant practice. Ready to raise your Quant score? Learn everything you need to know about getting a high math score with our articles on what a good Quant score is and how to ace Quant. In need of some test-day tips for Quant? Get advice on how to use the on-screen calculator and read our strategies for using your scratch paper. Previous Previous post: How Many Years Is a Master’s Degree? How Long Does It Take?